I read on how to instruction on the back. 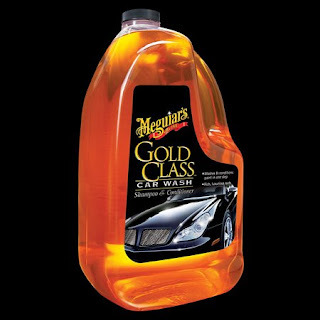 Meguiar's recommend 4 cap bottle mix with 1 gallon water. Something that messing in my mind is, what is the "Gallon" standar that they use? is it US Liquid or UK or Imperial? Based on this data, which one should I choose? UK and Imperial result the same value, so I bet I should use 4.546 Liter right? Hold on a second, let us read closely the back side instruction. Hm..., they didn't mention any of that. But may be, if I follow the maker of this product I can get preassumption which one should I take. The bottle had written it made in Holland. It is part of the Europe right and closer to the UK than the US, so they must use the UK Gallon convertion unit. Ok, lets prepare the bucket and clean it. I've only need about 2 Liter to wash my scooter, so I pour 2 cap of it and mix with water about 2+ Liter. I Spray the whole paint surface with water and hope that the grime will wash away and the dirt will get softer after I spray on it. I continue washing the paint surface, after that I continue on the other parts that has no paint at all. Spray again with water to dismiss the foam. Wow, the paint surfaces has repellent the water. The paint shine really great far better than my old car wash shampoo. This is the best car wash shampoo that I ever had. Oh this product is Biodegradable too, so it is safe for the environment.